Born: 3 September 1879, Llanmaes, Wales, United Kingdom. Died: 16 October 1968, Mutare, Zimbabwe. I.B. Pole Evans, botanist and mycologist, was the son of Reverend Daniel Evans, an Anglican clergyman, and his wife Caroline J. Pole. At some time he changed his surname from Evans to Pole Evans, but his name is often given as either Evans, I.B. Pole, or Pole-Evans, I.B. In 1903 he obtained the degree Bachelor of Science (BSc) at the University College of South Wales and Monmouthshire at Cardiff. 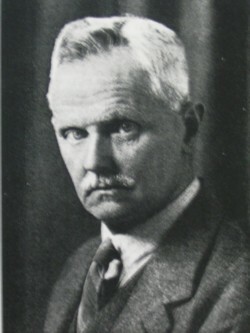 He continued his training as a research student under Professor H.M. Ward at Selwyn College, University of Cambridge, working on problems connected with rusts on cereals. In 1905 he graduated as Bachelor of Arts (BA), but a few years later was awarded the degree Master of Arts (MA). In July 1905 he was appointed as the first mycologist and plant pathologist in the Department of Agriculture of the Transvaal Colony, Pretoria, under the head of the Division of Botany, J. Burtt Davy*. Pole Evans soon established a mycological laboratory and initiated research on cereal rusts and on the life history and development of local fungi, reporting his findings in a series of papers and popular articles. His work laid the foundation for all future mycological work in South Africa. A paper on "The South African rust fungi: 1. The species of Puccinia on Compositae" was published in the Transactions of the Royal Society of South Africa (Vol. 5) in 1916. Several other mycological papers containing descriptions of interesting fungi appeared between 1907 and 1918 in various journals. About 20 notes and articles by him, on matters of interest to farmers, were published in the Transvaal Agricultural Journal during 1905-1910, followed by several more in the Agricultural Journal of the Union of South Africa during 1911-1913. In 1908 Dr Ethel M. Doidge was appointed as his first assistant and a mycological herbarium was established which later became the leading collection of its kind in South Africa. As the work increased other mycologists were appointed, the next two being Dr P.A. van der Bijl (1911) and Miss A.M. Bottomly (1913). After the formation of the Union of South Africa in 1910 Pole Evans became head of a newly created Division of Mycology and Plant Pathology in the Union's Department of Agriculture in 1912. When Burtt Davy retired during the following year the two divisions were combined under Pole Evans as the Division of Botany and Plant Pathology. From about this time he began to give more attention to the flowering plants of the country, concentrating at first on the aloes. He established a fine collection in the grounds of the Division below the Union Buildings, encouraged their cultivation, and described about a dozen new species in two papers entitled "Descriptions of some new aloes from the Transvaal" (Transactions of the Royal Society of South Africa, 1915-1916, Vol. 5). In 1920 the first part of The Flowering Plants of South Africa, a serial publication containing hand-coloured illustrations, was published under his editorship. The next year he initiated and edited the journal Bothalia, in which the taxonomic studies of his division were published. In August-September 1913 Pole Evans visited Mozambique at the request of the governor-general of that territory to study and report on the diseases affecting palms. A full account of this work was published only in 1918. Sometimes he and his staff had to implement unpopular measures in combatting plant diseases; for example, when citrus cancer began to spread in the Transvaal in 1916, threatening to devastate the citrus industry, he ordered the complete destruction of infected nurseries and orchards at great cost in the form of compensation. After a long and ruthless campaign the disease was eradicated and his actions came to be appreciated by those affected. From 1919 he studied the serious wastage in shipments of citrus and other fruit and formulated requirements for the cold storage of export fruit. This work led to the establishment of a low temterature laboratory in Cape Town in 1925, as part of his division. After 1918 Pole Evans no longer had time for the study of fungi, though this work was continued by members of his staff. He travelled all over southern Africa to record and photograph vegetation types, one of his concerns being the destructive effects of over-grazing on the vegetation cover of the country. The results of his studies of veld types were first reported in "The plant geography of South Africa" in the Official Year-book of the Union of South Africa for 1917 and subsequent years. Additional information was provided in his presidential address before the South Africal Association for the Advancement of Science in 1920, entitled "The veld, its resources and dangers" (Report, 1920, Vol. 17, pp. 1-34). In this paper he classified the country into nineteen botanical regions, providing a brief ecological description of each. Later he wrote a chapter on "The vegetation of South Africa" for the volume South Africa and Science (Crocker & McCrae, 1929), published in preparation for the meeting of the British Association in South Africa in 1929. The map accompanying this chapter formed the basis for "A vegetation map of South Africa", with descriptions of vegetation types, published in 1936 as Memoir No. 15 of the Botanical Survey on a scale of 1:3 000 000. This map remained unsurpassed until J.P.H. Acocks published his Veld types of South Africa in 1953. Pole Evans was instrumental in the appointment of a Botanical Survey Advisory Committee in 1918, to co-ordinate botanical research all over the country. He was appointed its chairman, while its members included leading botanists such as H.W.R. Marloth* and S. Sch�nland*. Research results were published in a series of Memoirs of the Botanical Survey of South Africa. The activities of the survey led to a rapid expansion of the National Herbarium, for which Pole Evans was responsible. The herbarium was further enriched by his acquisition of the private collections of E.E. Galpin* H.G. Flanagan*, Mrs A. Dieterlen*, Miss A.M. Pegler*, W. Tyson*, T.R. Sim*, and others. In 1926 he established the Veld Reserve at Fauresmith, where plant physiological research could be carried out on indigenous grasses and Karoo bushes. The next year the Divisions of Horticulture and Entomology were incorporated in his division, with the Field Husbandry Section following in 1929. At that time the name of the division was changed to the Division of Plant Industry. Additional research stations were established for citrus and subtropical fruit (at Nelspruit), deciduous fruit (Stellenbosch), and later tobacco (Rustenburg). During the nineteen-thirties a Pasture Research and Veld Management Section was created in his division and a series of plant research stations established in representative vegetation regions throughout the country to develop appropriate principles of veld management. He personally contributed significantly to the collection and intruduction of useful grass species, and later published papers on the value of African grasses in agriculture in the Empire Journal of Experimental Agriculture (1933, 1936, 1950). Over the years he travelled to several other countries in Africa, for example, in the winter of 1930 he accompanied the British botanist Dr John Hutchinson and General Smuts on a journey that took them as far as Lake Tanganyika. In 1931, and again in 1937, he collected grasses in Botswana. His last major expedition took place in 1938, when the government of Kenya asked him to advise them on pasture and conservation problems. Pole Evans was elected a Fellow of the Linnean Society in 1907 and became an active member of several local scientific societies. In 1906 he joined the South African Philosophicsl Society, remained a member when it became the Royal Society of South Africa in 1908, was elected a Fellow of the latter in 1911, and served on its council for several years. He joined the South African Association for the Advancement of Science in 1905, served as president of Section C (which included botany) in 1916, as president of the association in 1920, and received its South Africa Medal (gold) in 1922. In 1905 he joined the South African Ornithologists' Union. A few years later he became a foundation member of the Transvaal Biological Society, before which he delivered several papers. He served as its honorary secretary in 1909 and as president in 1911. This society amalgamated with the South African Ornithologists' Union in 1916 to form the South African Biological Society. He served as president of the latter in 1926, and in 1918 received its Captain Scott Memorial Medal. He was a member also of the South African Geographical Society. From 1905 to 1916 he served as an examiner in botany at the Bachelors and Masters level for the University of the Cape of Good Hope. After retiring in September 1939 Pole Evans continued to collect indigenous plants and described his expeditions to Botswana and Kenya in Memoir No. 21 (1948) and No. 22 (1948) of the Botanical Survey. He settled in Mutare, Zimbabwe in 1955. South Africa owes him a debt of gratitude for his farsightedness and drive in bringing together and inspiring a large and active body of researchers, and for his important contributions to botany, mycology, agriculture and soil conservation. In 1918 his former university in Wales conferred upon him the degree Doctor of Scienc (DSc). The British government honoured him as a Companion of the Order of St Michael and St George (CMG) in 1921, and in 1933 the University of the Witwatersrand awarded him an honorary Doctor of Laws (LLD) degree. In 1922 he married Mary R.H. Thompson, a mycologist on his staff, with whom he had a boy and a girl. The grass genus Polevansia, based on a grass he discovered in the mountains of Lesotho, was named in his honour, as were the plant species Aloe pole-evansii, Dinteranthus pole-evansii, Gladiolus pole-evansii and Albizia evansii, and the fungi Puccinia pole-evansii and Ravenelia evansii. Agricultural Journal (Union of South Africa), 1911-1913, Vol. 1-6, papers by Pole Evans. Bullock, A.A.Bibliography of South African botany (up to 1951). Pretoria: Department of Agricultural Technical Services, 1978. Crocker, H.J. & McCrae, J. (eds). South Africa and science: A handbook (Paper by Pole Evans). Johannesburg: SAAAS, 1929. Doidge, E.M. The South African fungi and lichens to the end of 1945. Bothalia, 1950, Vol. 5, pp. 1-1094 (see pp. 40-41). Gunn, M. Illtyd Buller Pole Evans (1879-1968). Bothalia, 1969, Vol. 10(2), pp. 131-135. In Memoriam: Dr I.B. Pole Evans, 1879-1968. Journal of the South African Biological Society, 1968, Vol. 9, pp. 41-42. Janse, A.J.T. A short history of the South African Biological Society. South African Biological Society Pamphlet No. 10, 1939, pp. 49-58. Killick, D.J.B. Fifty years of plant ecology in South Africa. Journal of the South African Biological Society, 1966, Vol. 7, pp. 11-28. Pole Evans, I.B. A sketch of the rise, growth, and development of mycology in South Africa. Report of the South African Association for the Advancement of Science, 1916, pp. 97-115. Pole Evans, I.B. Our aloes: their history, distribution and cultivation. Journal of the Botanical Society of South Africa, 1919, Vol. 5, pp. 11-16. Royal Society of South Africa. Transactions, 1908-1925, Vol. 1, 5, 6, 7, 12. South African Association for the Advancement of Science. Report, 1905/6, 1908, 1910, 1915, 1918, 1920. South African Geographical Society. Journal, 1917, Vol. 1(1), list of members. Transvaal [Colony], Department of Agriculture. Report, 1905/6, 1907/8. Transvaal Agricultural Journal, 1905-1910, Vol. 4-8. University of the Cape of Good Hope. Calendar, 1906/7-1917/18. Zimbabwe, Death notices, 1904-1976. FamilySearch https://familysearch.org/ark:/61903/1:1:QKZ7-QKWD accessed 4 January 2016.